Across the international arena, the importance of families working with schools in the interests of improving learning for students is increasingly being recognised. 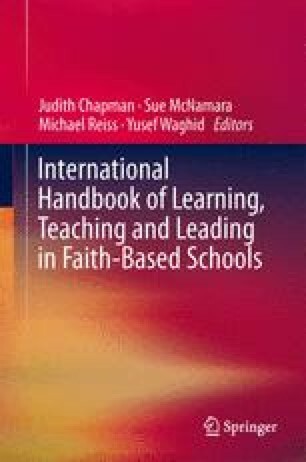 This chapter discusses a system-wide reform effort by four Catholic dioceses in the Australian state of Victoria directed towards improving student outcomes through strengthening family-school-community partnerships; and the role of educational systems in supporting and enabling such reform. The reform effort was located in the Australian Commonwealth Governments’ Family – School Partnerships Framework for parent engagement, based on Epstein et al.’s (2002) categories of parent engagement. This provided a useful guide for considering the multiple dimensions of family school partnerships and student learning. These dimensions included: communicating; connecting learning at school and learning at home; building community and identity; recognising the role of the family; consultative decision-making; collaborating beyond the school; and participating. Based on data collected from nine case study schools, this chapter discusses school and system level impacts on improved links between parent participation and student learning. The research which informs this chapter was undertaken as part of a Catholic Education Commission of Victoria funded project 2010–2013. Special recognition is given to the contribution of senior officers in Catholic education. In particular Stephen Elder, Maria Kirkwood, Elizabeth McQuade-Jones, Mary Tobin, Dennis Torpy, John Stafford, Shani Prendergast, Anne Speakman, Mary Lovelock, and Brenda Keenan.